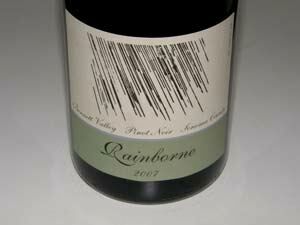 Established by winemaker Steve Kirby in 2007, Rainborne wines are strictly crafted from dry farmed vineyards. Kirby is a graduate of the viticulture and enology program at University of California at Davis. An excellent Pinot Noir is produced from a vineyard in Bennett Valley, located at the foot of Sonoma Mountain in Sonoma County. The wine may be purchased online through the website.